Remember Porter-Cable’s Model 121 portable spindle sander? Now Rockler offers an insert which allows you to mount it to the Rockler router table, turning it into both a portable and stationary tool — without taking up any additional shop space. Granted, you’ll also need Rockler’s exclusive router table kit. But considering the multi-use benefits of the sander in both portable and stationary mode — and the fact that the table will also serve as a router table — this could be a great solution for woodworkers on a budget or with limited shop space. To further add to the multi-tasking love-fest, you don’t even have to remove the plate from the sander in order to use it in portable mode; it actually gives you a wider, more stable base for handheld sanding. The insert is pre-drilled for the Porter-Cable 121 model sander. Available exclusively from Rockler, it’s $40. Remember, though, that you’ll also need their Router Table Kit. 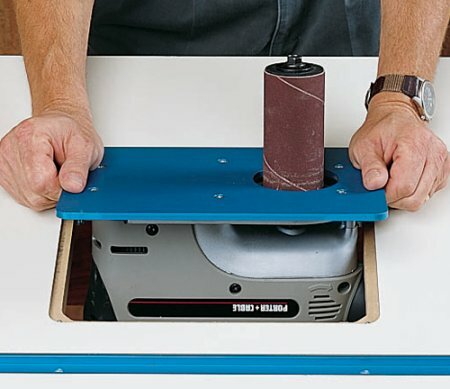 You could make your own table top to utilize Rockler’s pre-drilled sander plate, but the table kit is only $160. Either way, using their plate will ensure a solid base for your sander. Just as an aside, Woodhaven has their own version of this that is being discontinued. They’ve got two left if anyone is interested. Only thing is that it costs $10 more. To its credit though, this one is wider and more importantly it has three inserts to accommodate various sizes of sanding drum. Also comes with mounting screws.